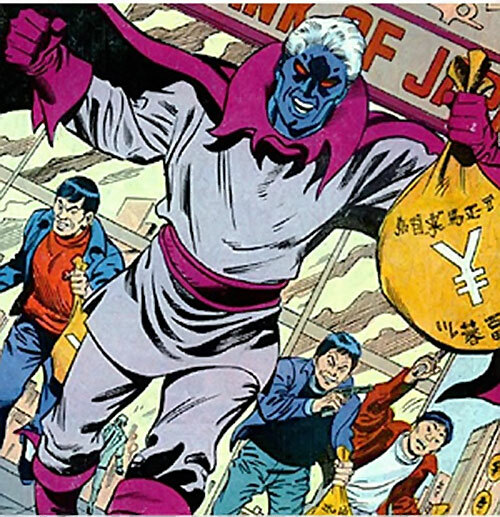 Corruptor is a Marvel villain, who first appeared in 1976. He’s a mind controller. Notably, he’s the perfect excuse for a hero vs. hero fight, or three. That’s pretty much what he was created for. Real Name: Jackson Day. The Corruptor form may have an actual demonic name. Other Aliases: Andrew Kappelhof, John Peabody. Group Affiliation: Formerly an agent of Imus Champion, and Head of the Inner Circle. Base Of Operations: New York City area. Height: 6’1” Weight: 225 lbs. Eyes: Brown (Day) / Glowing Red (Corruptor). Hair: Red (Day) / White (Corruptor). Corruptor claims to be a demon, but perhaps he’s just delusional. 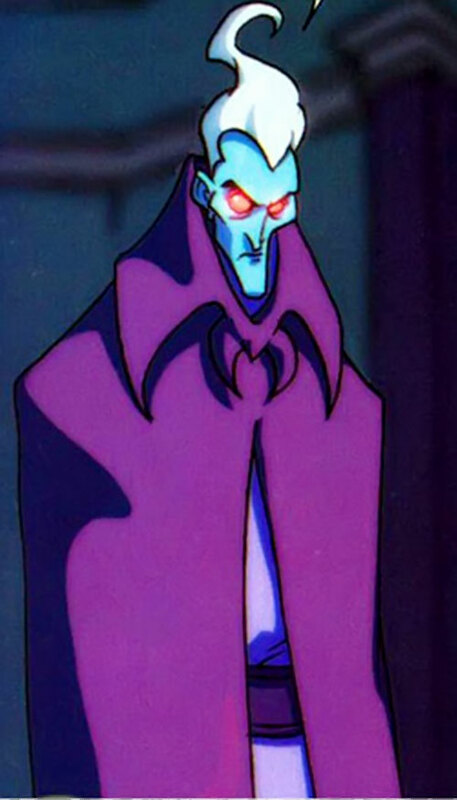 His main power is that he’s able to make people evil with but a touch. His sweat glands excrete powerful psychoactive drugs, which can be used to brainwash even powerful mentalities within seconds. This power can be resisted with enough willpower. But even stalwart super-heroes will likely have to spend Hero Points to. Furthermore, the Corruptor tend to spend Hero Points on his initial touch to ensure long-lasting effects, especially if the target looks powerful enough to wreck considerable havoc. He can maintain his control over his victims for, at least, days at a time. He has also been known to project powerful beams of energy out of his eyes. In his initial encounter he also proved himself an extraordinarily savage creature in a fight. He attacked with great power and alacrity, and could both withstand and deliver superhuman blows. Since he knew he could not stick around for very long, he tended to blow his Hero Points on Hypnosis, attack and defence, making him even fiercer than expected. In later appearances he was more in control of himself. The Corruptor rarely let himself get in a situation where he would need to fight, using lackeys to do his dirty work, and escaping when the heroes confront him. The Corruptor is of course the perfect excuse to have the PCs fight a super-hero of your choice — or even several — with little explanation. It might even be a more powerful hero, breaking free from the Corruptor’s hold just as the fight starts turning against the PCs. Jackson Day was a worker in a chemicals factory in Jamaica, Queens, NY. He was trapped in one of the storage rooms when a intense fire started. The firemen were having trouble controlling the blaze. Fortunately Thor happened to be flying by. Conjuring up a downpour, Thor put the fire out, then hammered away the doors to the area where Day was. Thor, however, arrived too late to prevent a strange transformation in Day. It had apparently been caused by fumes from burning chemicals. 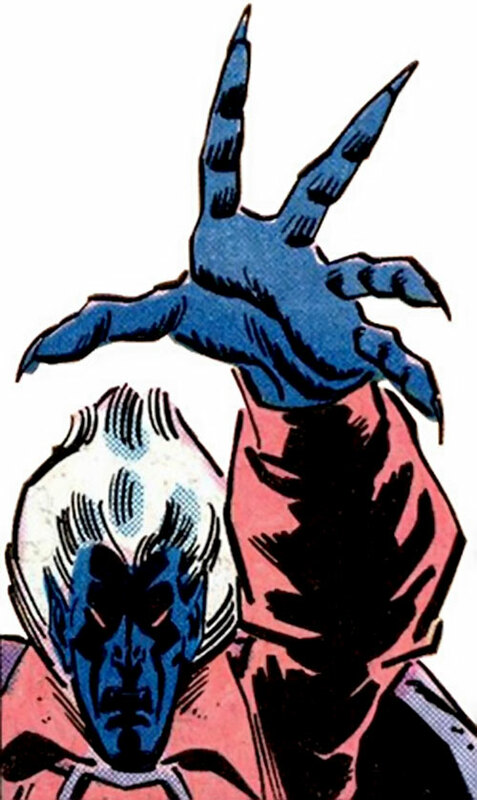 Day was now prone to transforming into the demonic Corruptor, who promptly assaulted Thor and turned him evil for a while. The evil Thor encountered the young Nova on the way, but the fight was thankfully brief and Thor soon recovered his free will. Determining that it was Day who now was the Corruptor, Thor and Nova went to his home. There Day transformed anew (and sporting a terrible, terrible costume he had just made, too). This time, however, he was easily defeated by the heroes despite his threats to touch random passers-by. Despite undergoing treatment, the Corruptor persona eventually became dominant, suppressing or eliminating Day entirely. He escaped custody, and set himself up as secret head of the criminal organisation, the Inner Circle. He used his powers to turn law-abiding citizens into criminals who did his bidding. The Corruptor was planning to amass an army of them, and take over New York. Unfortunately for him, he unknowingly targeted Nova’s father. This drew the young hero to investigate. Nova subdued what army he had managed to gather, and then confronted the Corruptor. After failing to monologue Nova into defeat, the Corruptor disappeared in a cloud of smoke through unknown means. He appeared next in California. He set up a base in an abandoned Spanish mission, and decided to place the Hulk in his thrall. 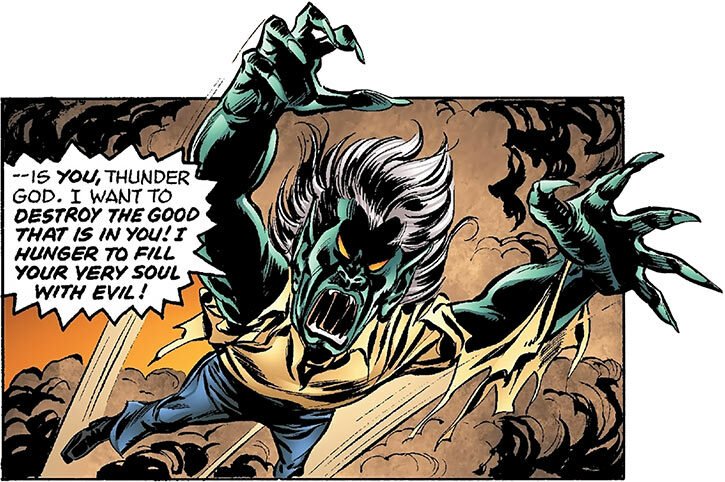 Discovering and reanimating the Night Flyer, he sent his new servant to hunt down the Hulk. The Night Flyer located Banner, conveniently driving by the Corruptor’s hidden base, and attacked. Banner changed into the Hulk and battled the Night Flyer, while the Corruptor watched from hiding. 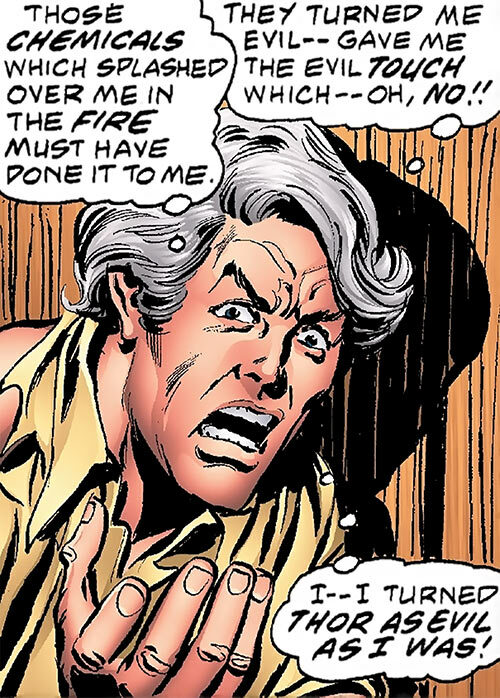 Day also blocked Rick Jones’ efforts to call the Avengers for help. When Betty Ross was injured, the Hulk became enraged, soon finishing off the Night Flyer. The Corruptor took advantage of the Hulk’s extreme emotional state, touching him, and bringing him completely under control. He then threatened to harm captive members of the Teen Brigade unless Rick calls the Avengers. Rick reluctantly capitulates. The call didn’t reach the Avengers. But local superheroes Red Wolf, Night Rider, Firebird, Texas Twister and Shooting Star, who respond to the signal. However, they were overcome by the Hulk. 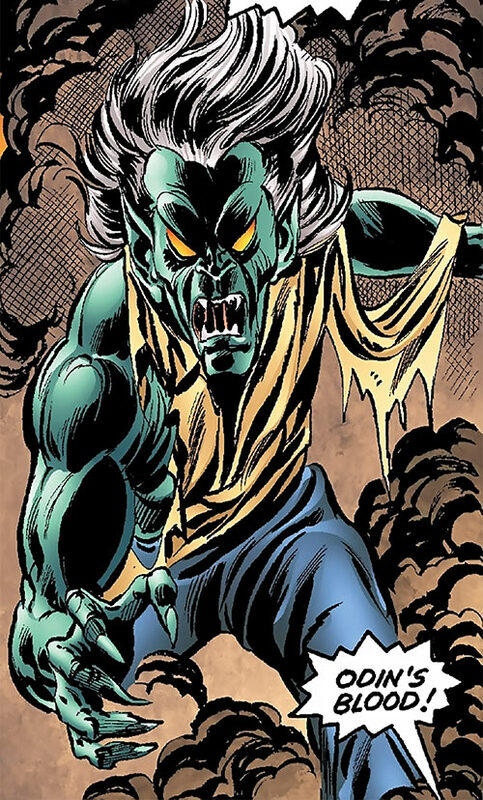 The Corruptor then ordered the Hulk to kill Rick Jones, but the gamma monster overcome his control and switched back to Banner. The Corruptor was then taken down by Lobo, Red Wolf’s wolf. He then travelled to Japan, hoping to be more successful in a country with little super-powered interference. He gathered together a group of flunkies to help in his crimes. However, a bank robbery he led was foiled when Sunfire happened to be flying by. The Corruptor was arrested by the Japanese police. Back in America, the Corruptor created the Hope foundation as a front for his operations. 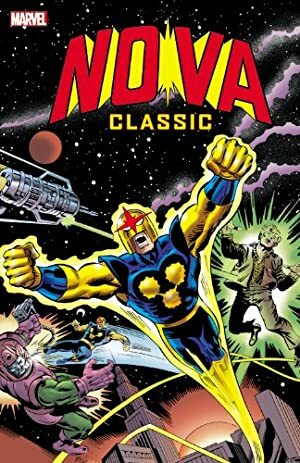 Gaining control of Nova, he sent him to attack the Daily Bugle offices when reporter Ben Urich’s investigations got too close to him. Spider-Man (Peter Parker) helped Nova come to his senses. The pair destroyed the Corruptor’s offices, and captured the Corruptor himself. The Corruptor was incarcerated at Project: PEGASUS. At some point during his time there he, became an agent of Imus Champion. Day managed to surreptitiously take over most of the personnel, including the Squadron Supreme, who were temporarily housed there. When the Avengers investigated suspicious events at PEGASUS, they discovered the Corruptor’s guilt, and freed the Squadron from his control. The Corruptor was eventually transferred to the Raft, but was among those who escaped during the breakout. He returned to his hometown of Smyrna, Delaware, where, under the identity of John Peabody, he became Mayor. Using flowers grown from water distilled from his sweat, infected the residents of the town with his ’evil touch‘. His plan was discovered by the New Warriors, roaming the country filming their reality TV show, and they put a stop to it. In his first appearance, he looked somewhat different. He seemed more like a demon or goblin, and his body language was way more savage. 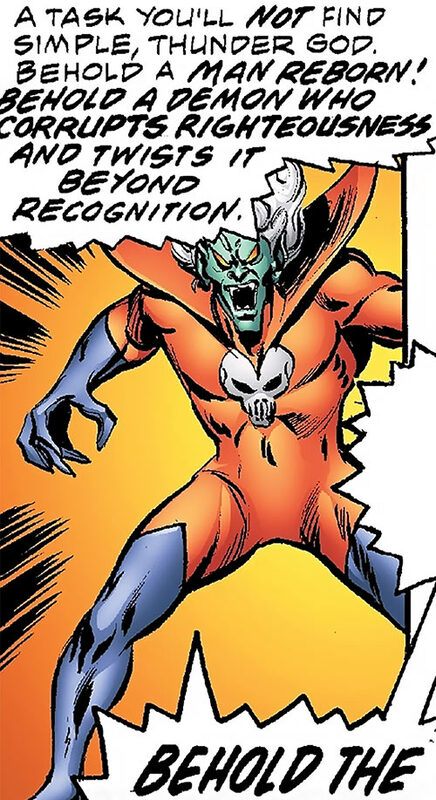 He briefly created the red costume with the skull on the chest for himself. But that thankfully was only seen for a few panels. Day was an average, though rather moral, person. The Corruptor is not. The Corruptor is convinced that it is a powerful demon dedicated to corrupting all that is good and just. He enjoys going into threatening, grandiose rants about it – as illustrated by the fierce quotes underneath. Since he doesn’t actually *do* much (mostly touch people and send them on their way), delivering the monologues right is important. During his most recent appearance, he was bemoaning being surrounded by nastiness, and how anyone he came near became evil. He, of course, delivered this melodramatically, and didn’t seem inclined to stop using his powers. Energy Blast is Minor Marginal. Hypnosis has No Range (Touch) – AV is thus DEX. Hypnosis is cause through chemicals, so Systemic Antidote is effective against it. An Hypnotized subject cannot use his HPs, and has all his EVs lowered by one CS. Unless target is in emotional state, he can only implant a tendency to be evil (see Corruptors Evil Touch below). Initially the Corruptor’s touch could only cause targets to act in an evil and destructive manner. It would make them rude, subject to violent tendencies, and less resistant about being driven to anti-social activities. Shortly before he tried to take control of the Hulk, he learned that, if the target was in a state of heightened emotions, he could gain more control over their activities. If he touches a person in an emotional state (GM’s decision, unless someone with emotion altering powers is involved) he is not as restricted in his commands. He may order them to do whatever he wishes. In his latest plot he cultivated flowers, Orchidius Corruptus, watered with his own sweat. These affected the inhabitants of his hometown with his powers. The flowers only possessed a diluted form of his power (8 AP), but spread its effect by smell (range of 1 AP), and only made them anti-social. In his initial appearance he uncontrollably shifted between his Corruptor and Jackson Day identities after brief periods (about 15 to 20 minutes). Furthermore, his Hypnosis had the additional limitation that it ends when the Corruptor reverts to Jackson Day. He was unaware that he could give more complex commands if the target was in an emotional state. During this appearance he also seemed more physically energised, having DEX 08, STR 12, BOD 12, and Acrobatics: 05. By Sébastien Andrivet and Gareth Lewis. Helper(s): marvel.com , Chris Cottingham.